The Streets of LA turn to paradise. The new dingbat gives birth to flora creating a series of beautiful and unique skins visible from cars driving by the neighborhood. The street, formerly occupied by decorated shoe boxes, now emerges; a crowd of lined up sensual curves reminiscent of the Californian hills and the waves of its ocean. The radical and the exotic collide exposing the qualities of its nature and culture. The beauty of self expression is amplified in the skin of the city of angel’s new dingbats. 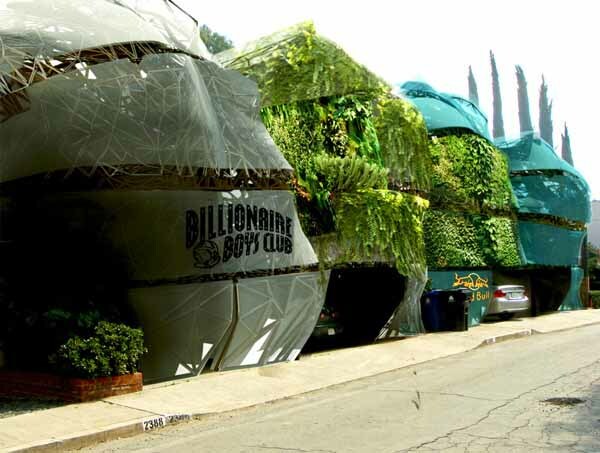 L.A. dwellers are able to turn the floral skins of their dingbat to their own desired aesthetic landmark. Fitting for a city where, more than most, each person is trying to forge an identity , not being just another formless face in one of the world’s biggest centers of business, international trade, entertainment, culture, media, fashion, science, technology and education. These floral skins and vertical gardens not only enhance the urban aesthetics but also serve to absorb the cities pollution. The USA is second most polluted city in the world after China. Los Angeles is one of the most polluted US cities, engulfed in a blanket of smog for much of the year. Dingbat Renaissance goes beyond LA’s shallow “green” trends of whole foods, Eco Fashion and recycled polystyrene cup surf boards. The Green infrastructure removes harmful chemicals in the air and gives out Oxygen both in the day and night. This move is a reaction to present day’s ecological evolution and the need for healthier psychological, physical and social growth within the American family. Today, perhaps more than ever before, American attitudes are simultaneously permeated by feeling of optimism and by a sense of urgency that action must be taken to preserve the planet. Dingbat Renaissance addresses both these feelings directly beckoning a cultural rebirth in both large urban and small domestic scale. This is achieved through the desire for a delightfully diverse, safe, healthy city with clean air, soil,water and power providing an economically, equitably, ecologically, and elegantly enjoyed backdrop and shelter for American life in Los Angeles, California. The human torso has been chosen as the three-dimensional face of the new dingbat because of its horizontal chest muscle subdivision (expressing the dingbat’s levels).Here lies it’s enclosed ‘cave-esque’ interior tectonic and its external homage to Michelangelo’s unfinished sculptures. The great unfinished masterpieces sculpted out of stone by Michelangelo captures the energy, struggle, vulnerability and beauty of a human being even more than it would if it would be finished. With a whole row of twisting torso’s lined up in an artistic manner we get an inspirational idea of the common unfinished struggle to achieve the true American dream. The plan is rational. The oval shape allows rooms to face and lead to the center of the space. This has been done with the intention of unity within the American family. The new dingbat has four levels. As we go up the importance of the space increases keeping the most sacred of spaces farthest from the street. Cars and storage space occupy the first level. The second level provides shared space; kitchen, living room,dining room, bathroom. The third provides private space; bedrooms or offices. The last level is the roof which holds an outdoor pool deck or roof terrace for rest, solitude, meditation and a view over local Santa Monica. The facade of dingbat Renaissance blurs the line between interior and exterior connecting the home with Mother Nature. The façade has two skins; one skin is for personalization, vertical farming, sound screening and interior shading. This skin also allows there to be a ventilation gap and can be modified through different times of the year by the dingbat owner depended on the occasion. The second skin contains glazing; this allows a 360 degree source of light to enter the interior. By being enclosed in the many beautiful layers of floral membranes and skins which can interchange, duplicate, be personalized and even grow, decoration becomes functional, satisfying both modern and post-modern architectural ideals. “Life is more” and this is reflected in the architectures most exuberant qualities. Dingbat Renaissance is a reflection and enhancement of today’s built form of our cultural ambition, one of celebration and hope of reflecting and enclosing the yet to come unwritten stories of life, liberty and the pursuit of happiness.